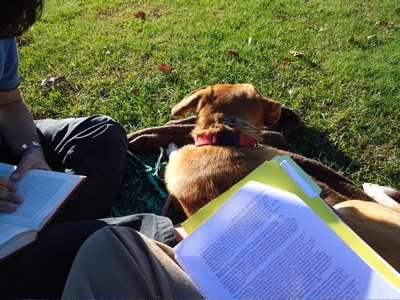 We spent Saturday afternoon by the lake, on a blanket, reading. Looks cozy, but actually it got pretty windy, and after an hour or so we retreated indoors for nachos. I rewarded myself with a margarita. See, all this is relevant because in these pictures, even though you can’t see it, there is yarn in my bag. Malabrigo, to be exact. 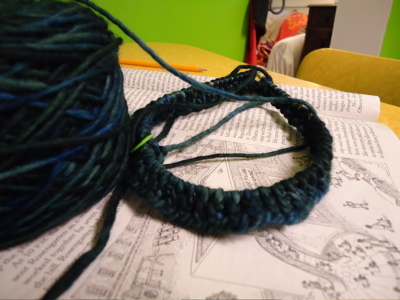 And it is destined to become another windschief hat. This one’s for the boy. This entry was posted in knitting, out of doors and tagged boh, fall break, hat, knitting, lake, malabrigo, outside, windschief by barefootrooster. Bookmark the permalink. I want a fall break! Sadly, I just can’t convince my job…. Sigh. 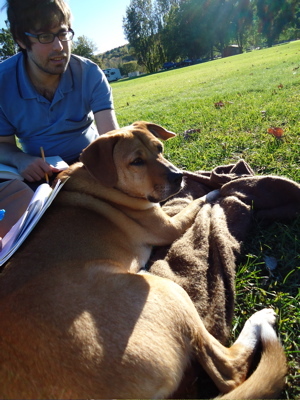 Looks like Boh was a big help studying…. :-) Have a great knitting evening! Sounds like a perfect start to break! I hope you’re enjoying some well deserved time off with the two Bs. And yummy yarn, too, of course. Such the snuggly dog! And yarn. Have a great break! I have some leftover Malabrigo that should be enough for a hat. I’m totally tempted to use it for Windschief now. Enjoy your fall break! It finally felt like fall here this morning with a spot of mist and cold air. yay! What a nice, relaxing day! Aren’t breaks wonderful? They should have them in the work-world, too! Mmmm, malabrigo. Always a joy to knit with.